Can you guess what the nineties television movie, 'The Ghost Writer', and the eighties television series, 'Chicken Soup', both have in common? Yes, dear reader. That is correct. They were both directed by the director of this movie: Alan Rafkin. Although I'm pretty sure they didn't have much to do with the Actors: Don Knotts, Joan Stanley, or Liam Redmond. Especially for 90-minutes in 1966. Bless. Hey! You know that old Simmons House at the end of the street? You know. The spooky one that Nicholas Simmons (Philip Ober) is planning to tear down. Well, guess who has to stay there for the whole night, and write an article about it? Huh? What's that you say? You don't know! Alright then. I'll give you a couple of clues to help you along your way. Firstly, he recently mistook a drunken-man for a dead-man. Secondly, only the other day he wrote a small piece about the old Simmons place, relating to the twentieth anniversary of a grizzly murder that took place there. And thirdly, he was given this assignment by his editor, Ollie Weaver (Skip Homeier), prior to having lunch with his gal-pal, Alma (Joan Staley). Yep. You've got it in one. 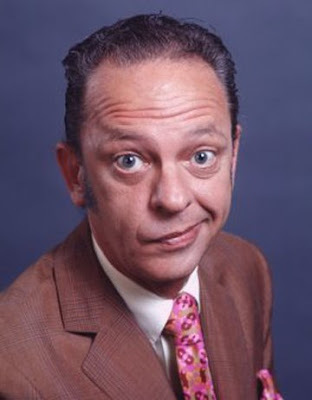 It's the bumbling typesetter the whole town knows as Luther Heggs (Don Knotts). However, will Luther be able to carry out this haunted task? His pal, Kelsey (Liam Redmond), likes to think so. Still, once he ventures inside this rustic abode, will he be able to stand the sound of the organ that chimes at the stroke of midnight? Furthermore, will he then sh*t himself when he sees the painting dripping with blood? No. I'm not going to tell you the answer to these questions, folks. What I will say though, is what next transpires all kicks off when an article throws a spanner in the works. As Luther gets sued for libel - a courthouse needs a new bible - the Simmons house needs a second look - and at the end of a day, a bumbling type-setter is A-OK in my book. Now if you think that 'damn' is a swear word, or that the sight of a man falling over is funny, then, I have a sneaking suspicion you'd like 'The Ghost and Mr Chicken'. Granted, I don't think that this comedy would be everybody's cup of tea. The style is pure 50's Americana. Most of the jokes are of the jovial variety. And all of the characters are very 'of their time' too. Still, that doesn't necessarily mean that it didn't tell a good story overall. It did. Quite a nifty one actually. Full of dips and valleys, that could only be described as... errr... how can I put it? Yeah. It's this type of movie, dear reader. A movie you're Grandparents might laugh at, where as you might think of it as being 'so-so' at best, or 'boring' at worst. As for me on the other hand -- well -- if truth be told I'm split between these two definitions. It wasn't one of those laugh-out loud funny films -- although I did laugh on occasion -- especially at the courthouse scene, and at the old ladies in this flick. Plus it wasn't very yawn-some either -- although I did yawn once or twice -- especially at those scenes where 'Luther'... errr... spoke. Here, before I get a bit too nasty about 'The Ghost and Mr Chicken', please check out these relatable filmic-facts. (1) 'Universal Pictures' released this family comedy on the same day that the comedian, Rainn Wilson, was born -- the 20th of January, 1966. (2) During production, this movie was given the working title of 'Running Scared', which is also the same name as the 2006 crime-thriller starring Paul Walker and Chazz Palminteri. 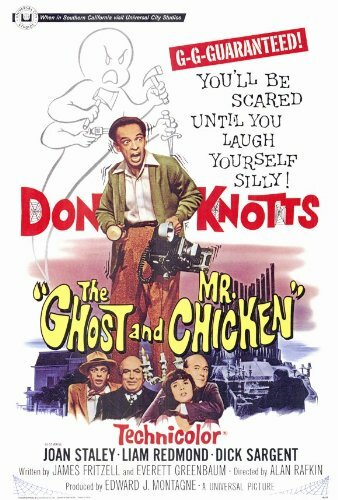 (3) This was Don Knott's first feature film after leaving the 'Andy Griffith Show'. But you can also see some his old cast members in this production if you know what you are looking for. Hal Smith plays the town drunk, whilst Dorthy Neumann plays his wife. Also, Burt Mustin, Lurene Tuttle, and Hope Summers, all play small cameos in this muddled mystery too. (4) I kid you not; this slice of cinema was one of the few American films shot with the Technicolor Corporation's Techniscope wide screen process. Basically, this 'wider image' was achieved by splitting the frame horizontally in two, whilst increasing the height in the process. (5) Contrary to popular belief, the exterior of the Simmons House wasn't the same one built for the Alfred Hitchcock thriller, 'Psycho'. Although it was used on the television show, 'The Munsters', the street was used on the Tom Hank's horror-comedy, 'The Burbs', and you can now see the Harvey House on the television drama, 'Desperate Housewives'. (6) One of the running gags in this film -- 'Attaboy Luther' -- became a short-lived catch-phrase when it was released. (7) Two of the screen writers associated with this project, James Fritzell and Everett Greenbaum, wrote for Don previously in the 'Andy Griffith Show', as well as wrote for such television sitcom's as 'The Odd Couple', 'M*A*S*H*', and 'Sanford and Son'. (8) I'm sorry to say that Jesse Donald Knotts died of lung cancer on the 24th of February, 2006, in Los Angeles, California. OK, so where was I? Oh, yeah. 'The Ghost and Mr Chicken'. 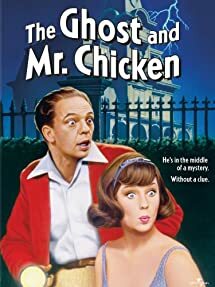 Now to cut to the chase, try to think of this film as an episode of 'Scooby Doo', with 'Munsters' music, 50's archetypes, a very stoic plot-line, plus a style of comedy that's less 'funk' and more 'ka-plunk'. Honestly, if I had a stab at updating this flick, I'd sod the whole 'knock down the haunted house' premise, and replace it with Luther getting it on with that girl who played Alma. (My God! Was she a stunner!) But that's not going to happen, is it? And all we are left with is a very nice film with a very nice story and a cast of very nice characters. Nice. And that's all I can say on the matter. Nuff said.